In our first blog, we want to address a common question. What does the IELTS exam comprise? Firstly, there are two modules of the test-­‐ Academic and General. IELTS Academic is for those who want to pursue higher education in an English speaking country and also for medical professionals who want to either study or engage in professional practice in such countries. IELTS General is for immigration to English speaking countries. Hello all, To continue with our blog on PTE Academic, we bring you the last part of the PTE Listening Test. We introduced the first three question types in the last blog. Today we are going to look at rest of the tasks, first of which is to highlight accurate summary. If you have missed our previous blogs, we have published 4 blog topics – (1) What PTE Exam is about, (2) Speaking Skill Test Part 1, (3) Speaking Skill Test Part 2, (4) Writing Skill Test, (5) Reading Skill Test, and (6) PTEListening Skill Test Part 1. Do visit these pages to gain more. PTE Listening tests your ability to understand, analyze and identify the most accurate summary of the lecture. Here, you will listen to a lecture. You are given 4-­‐5 options of the summary of the lecture. Test expects you to highlight the correct summary. 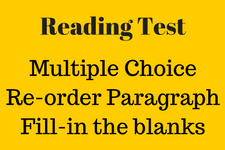 This is similar to multiple choice choose multiple answers. The difference is that you need to select only one option. This type of question tests your ability to predict what the speaker is going to say next, based on the clues in the lecture. The last sentence of the lecture is incomplete. You need to complete the sentence using the options given. There may be one word or a group of words. We train you to identify sequencing of information and predict how the speaker may continue. This tests your ability to identify errors in a transcript and also match the text with speech. The transcript of the lecture appears on the screen. But some of the words in the transcript are different from what you hear. You are required to highlight such words. It may seem easy. However, a word of warning. This question type has negative marking. This is based entirely on your co-­‐ordination of reading and listening skills. Hence we give you tips on enhancing your listening skills. 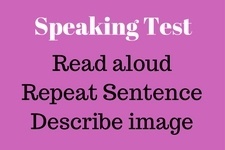 In this test, you will hear a sentence of about 10-­‐12 words. You have to type the sentence exactly as you heard it with correct spelling and punctuation. During the tests, you may get 3-­‐4 such tasks. We give you tips on memorizing and reproducing. So, friends this brings us to the end of our blogs on PTE academic. We hope it answered most of your questions. If you have any more questions, please feel free to contact us on the phone numbers given on our website. Our next few blogs are for those of you who are interested in appearing for IELTS exam. Hello, again friends. Last few blogs gave you information on speaking, writing and reading skills of PTE Academic. 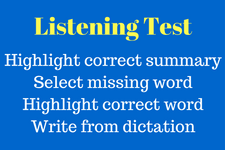 To continue with our blogs about PTE Academic, we are bringing you PTE listening skills this week. 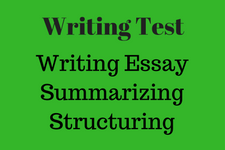 If you have missed our previous blogs, we have published 4 blog topics – (1) What PTE Exam is about, (2) Speaking Skill Test Part 1, (3) Speaking Skill Test Part 2, (4) Writing Skill Test and (5) Reading Skill Test. Do visit these pages to gain more. This comes after an optional break of ten minutes after the reading section. The listening section is for 43-58 minutes depending on the number of tasks you get. There are two sections and eight item types in all. You might get two-three of each type. Now let us look at each question type. The first section has one type of task that is summarize spoken text. The exam will judge you on your content, form, grammar, vocabulary and spelling. Here you listen to a lecture of 1-1 ½ minutes and then write a summary of the lecture in 50-70 words. The time allotted for each question is 10 minutes. This is the only question type that is individually timed. We definitely train you to identify the main idea and the supporting ideas of the lecture. Give you tips on how to organize your summary and also on time management. From here the questions are not individually timed. You get 23-28 minutes to complete all the tasks in Section 2. This is the first question type in section 2. A question appears on the screen with various options. Then You will hear a short lecture. Based on the question you need to select more than one option. We definitely train you to identify the answers in the shortest possible time. This question type shows the transcript of the lecture on the screen with a few words missing. You have to fill in the missing words. There may be 4-6 words missing. We certainly give you tips on how to improve your listening skills. Information on the rest of the question types will follow shortly. Till then we bid adieu. Have a great weekend. This week we are going to look at the rest of the questions of the PTE speaking test. But before that let’s look back at our earlier articles. Good To Excellence is Pearson recommended training institute for preparing PTE academics exam. If your interest is to appear for this exam, it is good to read our earlier blog article What PTE exam is about. Last week we took you through the first three questions of the speaking test of PTE academic. If you missed reading that article, you should first read Preparing for PTE Speaking Test before reading this article. Now, let’s cover rest of the questions of the speaking test. Here you listen to a lecture of about one – one and a half minutes. Once the microphone opens, you have to give a summary of the lecture in 40 seconds. This question type tests your ability to identify the main idea and the supporting ideas of the lecture. This is a mini presentation. We teach you how to identify the main and the supporting ideas. We also give you clear tips on note taking which is an important aspect of PTE test. This takes a lot of practice. We train you to organize your speech coherently. This question type tests your general knowledge. You are asked a question sometimes accompanied by a picture. You do not need to answer in full sentences. Just one-word answers are accepted. We give you definitive tips on improving your general knowledge. You also have access to our question bank. That brings us to the end of the speaking section that tests your ability to reproduce what you have seen or listened to, under the time constraint. Your scoring happens on content, pronunciation, grammar, vocabulary and oral fluency. How do I develop my speaking skills you might ask. Well, you could improve your English by using the language as much as possible. Look out for opportunities to speak in English. It is only with the use of the language does the fluency improve. This is one of the reasons why the language test results are valid only for two years. If you are not in constant touch with the language, you tend to forget it. So our advice to you is to keep speaking in English. We will bring you one more skill next week. Have a great week. Bye bye till then. Hello again. As promised we are back again with question types of PTE examination. If you want to know about what PTE exam is, please refer to our earlier post HERE. First of all, let us have a look at the speaking test, shall we? One important thing you must remember throughout the speaking test is that you should not take a pause of over 3 seconds or else the microphone will close, and you will not be able to answer the questions. The first question in the speaking test is the introduction which is not assessed. This is mainly for the universities to get to know the students. Here you will be asked to introduce yourself and talk about your interests, why you want to study etc. You can choose one or more of the options given and prepare for 30 seconds and speak for 30 seconds after the microphone opens. In this question type, a passage appears on the screen. You have 40 seconds to read and 40 seconds to speak. There are 6 or 7 questions of this type. Pronunciation and Oral fluency are what is under test in the speaking test. We train you in sentence stress, give you tips on how you can maintain fluency and also tips on intonation. We give you a lot of practice in reading if that is what you need to improve. The next question is repeat sentence. You listen to a sentence of 10~12 words. Then you repeat it exactly as you heard it. Thereafter you will get 10~12 such questions. Some students find it a little challenging. We give you definitive tips on different ways of remembering the sentences. In this question type, you get an image on the screen. It could be any kind of graph, a picture or a scenery, you get 25 seconds to read the image and 40 seconds to describe it. There will be 6-­‐7 of these questions. You are expected to use specific words and phrases to describe it. We give you the language that you should use for this and the structure that you should be following. Our next blog will deal with the rest of the questions of the speaking section. Adieu till then. What PTE exam is about? Many of you are looking for opportunities abroad or to continue your education in other countries. To achieve that dream you need to appear for either PTE or IELTS exam. So we have a series of blogs to take you through the exam pattern. Lets first see what PTE exam is about? We will also give you information on how we prepare you for it. First of all, let us see what PTE exam is about. To know about our PTE training course, you can click HERE. This exam tests your ability to survive in an English speaking country in social and academic situations and tests you on all four skills namely, Speaking, Writing, Reading and Listening in that order. It is an online test lasting about three hours. To book your exam you need to go to pearsonpte.com and create a Pearson account. You will receive an email with your login details. Using that you can choose your location and book your test date. When you book make sure your name is exactly as it is in your passport. This is very important. We have seen cases where candidates were not allowed to take the test as there was a slight difference in the name. It is better to book in advance to get the location, date and the time slot of your preference. The best part of PTE is that you get your results within 5 days. However, most of the time it is in your mailbox within 24 hours. You get an email giving you a link where you can access your results. Each skill is for 90 marks. You also get an overall score out of 90. Apart from that PTE exam is also to assess you on enabling skills as well which are grammar, oral fluency, pronunciation, spelling, vocabulary and written discourse. This is only for your reference to see what the areas of your improvement are. First of all, relax. Plan to be at the test center at least 30 minutes before the scheduled time. Take your original passport with you. Once you reach the center register and handover your passport. They shall give you a locker key. Keep all your belongings including your watch in the locker. You are not allowed to carry anything into the examination hall except for the locker key. Your biometrics and photograph are taken and you are allotted a system. The centre shall give you an erasable notepad which you can use to take notes. You can ask for more if you run out of pages. 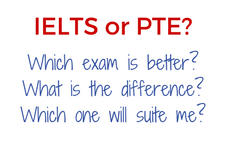 Await the next blog for details of the question types of PTE exam. Have a good day. It has been quite long since the last post. So without much ado here is a tip for writing. Lets see the use of “due to“. She came late to class because of traffic jam. (not she came to class due to traffic jam). Institute’s success was due to combined efforts of the office bearers. The president is due to arrive on Sunday. Rs. 20,000 was due to the provision store. Use it to improve your writing skills!